This recipe book has been created to help everyone eat more plant-based nutrient-dense food that makes you feel good. All recipes are vegan and gluten-free but this book is not just for people following those diets. 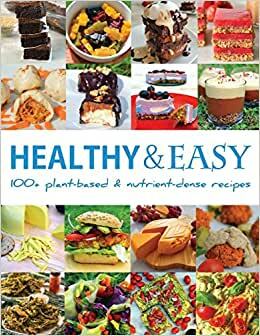 Whether you are vegan, health conscious, allergic to dairy or just trying to incorporate some more healthy plant-based recipes into your diet you will find something here. Includes over 100 recipes from Nest and Glow. Only the most popular recipes have made it into the book, along with over a dozen new and exclusive. Recipes have been tried, tested and updated. 5.0 out of 5 starsAmazingly Easy, Unique, and Delicious Recipes! Highly Recommend! The cookbook is worth the price! It is printed on demand which accounts for the higher price, but well worth every penny! The pictures of each of the finished products are colorful, beautiful, and large (a whole page for each recipe). A variety of easy to cook recipes and so delicious! The directions are well written and simplified! It is not a duplicate of the many other recipes online or in other plant-based cookbooks. I am so excited to have this great cookbook that makes cooking vegan so delicious and fun! I love this cookbook. We got it mainly for the sweets. The recipes are simple and delicious. Outside of having to order gar gar (which I found on Amazon), there aren’t any complicated ingredients that you can’t find at you local grocery store. 5.0 out of 5 starsAWESOME recipes that look YUMMY to help my family get healthy! I've been struggling with how to get my family to eat better. They're just SO picky! This book is quickly becoming my go-to for great recipes that are NUTRIENT DENSE. And look easy! I don't have a lot of time so ease is important. I highly recommend this cookbook. Bastian makes the recipes easy, gluten free, and fat free. He also provides some great bits of information on the side of each recipe. I bought 6 of these for all the cooks in my family. 5.0 out of 5 starsTruly easy-peasy. This book has so many great recipes, it's amazing. It's helping me transition to a vegan lifestyle.